So, I think it has become quite obvious that I love curry. 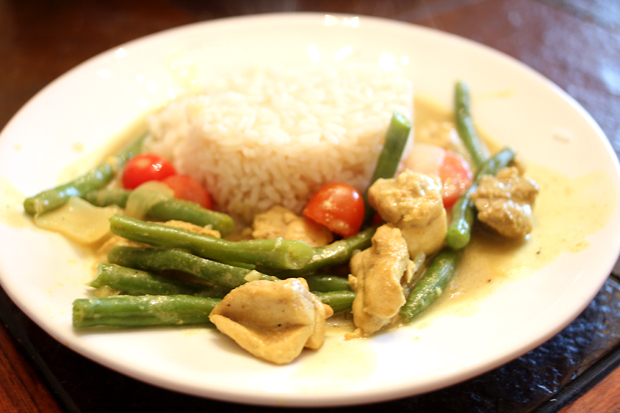 I have to admit, I hesitated sharing this recipe with you guys on this post because my last food post was also a curry dish. But then I thought, it's not like this is some kind of publication--this is just my blog. And hey, I just made this last night, I liked it, so I am going to damn well share it! This dish was a hit. 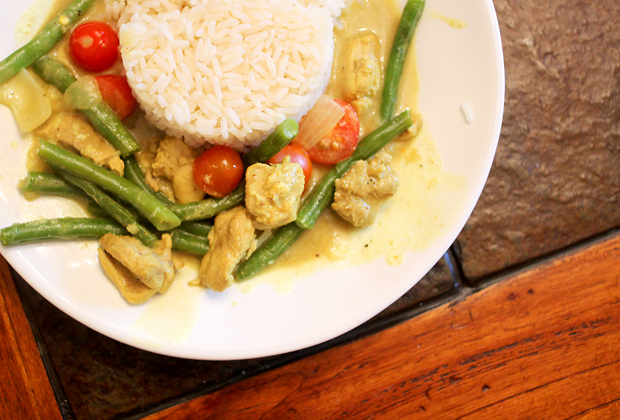 To me, it's just a healthier take on the traditional style Caribbean curry chicken. Instead of potatoes, string beans are added--which equals less starch, less carbs and less calories. On hindsight, I think throwing in some shredded carrot would have been awesome too. It was super easy to make, and for the most part I followed the recipe exactly. One thing I did do differently was instead of "burning off" some of the liquid in the end. I added a tablespoon or two of corn starch to thicken it. I like my curry to have plenty "gravy". Oh, and Publix didn't have bird pepper, so I just added a little bit of chopped serrano pepper. We likes it spicy over here. I got this recipe from a Caribbean cooking blog that is amazing. I've made a few of his dishes and they all were great. Check it out. Recipe found HERE. Yay, digi handshake + hug on that one! We have more building to do.Thanks, mama! Thanks for linking the Caribbean cooking blog! My boyfriend is Jamaican and I need to learn how to cook his favorite dishes. Your dish looks like it came out delicious! You're welcome! Yes, your guy will love all of those dishes on that site. I've made a few, and my hubs loved every one! I'm gonna try this next week!